Beautifully engraved certificate from the J.W. Mays, Inc. issued in 1967-1978. 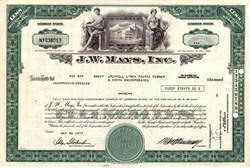 This historic document was printed by the Security-Columbian Banknote Company and has an ornate border around it with a vignette of an allegorical man and woman on both sides of a Mays Building. This item has the printed signatures of the Company�s President and Treasurer and is over 24 years old. The company owns and leases six properties in and around New York City -- mostly former J. W. Mays department stores -- and a warehouse in central Ohio. 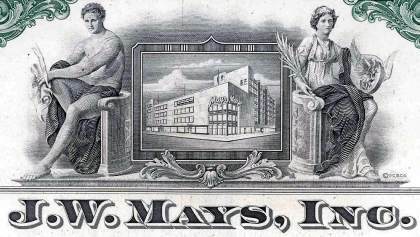 J. W. Mays leases its properties to retail stores, restaurants, offices, and other enterprises. The department store chain, founded in 1924 by Russian immigrant Joe Weinstein, closed in 1989 when management realized the New York real estate it occupied was worth more than its struggling discount retail business. Weinstein's descendants, including chairman Lloyd Shulman, own over half of the company, although relations among the heirs have not always been harmonious.